I am re-visiting this topic again from a different angle. but that is not necessarily true because one of the earliest language of the Bible is Aramaic, which is ancestor to both Hebrew & Arabic. Also, along history, a lot of the Hebrew text were lost. The GNS was the earliest translation (3rd Century) from all the languages used at that time. 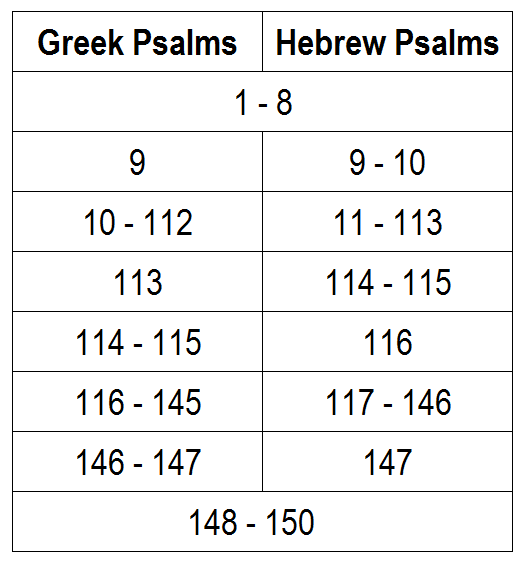 Another reason why the GNS may be more correct is Psalm 9 is one Psalm in GNS, while it is in two psalms in HNS as Psalm 9 & Psalm 10... and Wikipedia (http://en.wikipedia.org/wiki/Psalms#Numbering) explains it as, "The variance between Massorah (HNS) and Septuagint (GNS) texts in this numeration is likely enough due to a gradual neglect of the original poetic form of the Psalms; such neglect was occasioned by liturgical uses and carelessness of copyists. It is admitted by all that Pss. 9 and 10 were originally a single acrostic poem; they have been wrongly separated by Massorah (HNS), rightly united by the Septuagint (GNS) and Vulgate." The Roman Catholic Church has used the Greek Translation probably due to it being more accurate and has translated it to Latin (Vulgate). Officially, the Catholic Church in Rome is using the GNS. Other places I know using the GNS are UK & Singapore. USA (America) is using the HNS and I suspect it is because of the predominantly Protestant influence. The internet is using the HNS, which explains why it's getting to be popular. In Singapore, you may see a lot of Psalms with the HNS because of the American influence. This site, the United States Conference of Catholic Bishops (http://www.usccb.org/) is an example. I am trying to be flexible by understanding both numbering systems, but it is not easy. I am leaning towards the the GNS because I am based in Singapore. How would you know if it's HNS or GNS? Not easy. I take my ref from a few sources and compare. For GNS ~ I use the Official Sunday Missal for Singapore use & an old book of Psalms by Fintan O'Carroll. Ok... that's it from me... my brain can hardly take more anyway. For more... at these links on my blog are the explanations of why the different numbering systems as and when I research on it again.